Wednesday 30th June 1915: A soldier of the Leicester Regiment has appeared at the Bedford Borough Sessions charged with obtaining food valued at 1s 6d from Emma Amos by false pretences. Jack Smith, alias John Miles, alias David Ross had previously been convicted on a similar charge here at Bedford in October. At that time he was serving as a private in a Scottish Regiment, from which he was discharged as a result of the conviction. It was stated that Smith had called at houses in Bedford, Wilstead and Goldington claiming that he needed to billet a large number of soldiers. He arranged for the residents to get food in, which most did, putting them to a great deal of inconvenience. He got nothing from them for himself beyond a drink or two. He obtained food and lodgings for a night from Emma Amos on the same pretence. 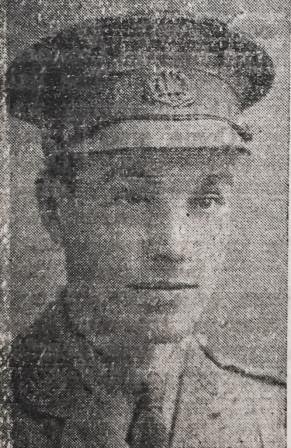 Captain Porter of the Leicester Regiment, which is stationed at Luton, told the court that Smith had been in his Battalion since January 3rd, since when there had been only one small complaint against him. Smith himself gave a written statement, which merely repeated promises of reform he had made last October. The Recorder was unmoved and Smith was sentenced to twelve months imprisonment with hard labour. Tuesday 29th June 1915: Isabella Knight of Luton has appeared before the Dunstable Bench charged with wearing uniform of the Royal Engineers in a manner likely to bring contempt upon it. 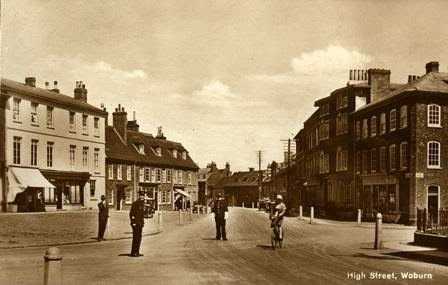 At around 7pm last Wednesday Private McGuigan of the 2/5th Sherwood Foresters (military police) was in Dunstable High Street with Private Albert Holmes of the 2/7th Sherwood Foresters when he was told about Miss Knight. He went to Prosperous Row and saw her wearing a pair of military trousers, jumping and dancing with other women in an unseemly fashion. He asked her to go indoors and take off the trousers, but she said she would not and told him it was none of his business. Miss Knight continued to dance about the road and then climbed over a wall. Police Constable Tingey said he was in St. Mary’s Street and saw a crowd gather at the corner of Bull Pond Lane. He later went to Knight’s house with Private McGuigan. They asked how she came into possession of the trousers. She said first that her mother had bought them, and then that her mother had got them to mend. The trousers had a stamped number on them and belonged to the Royal Engineers stationed at Houghton Regis. When told that she would be summoned for bringing His Majesty’s uniform into contempt the young woman replied “I don’t mind if you do”. The Clerk of the Court said Miss Knight was always getting into trouble and the Mayor reminded her that the last time she was there she had been given a severe warning, but leniency did not induce her to do right. She was warned that unless she changed her way of living she would come to a bad end and told this was a much more serious offence than she imagined. The Bench wished to give her another chance but could not overlook the offence entirely so sentenced her to 14 days in prison. The girl was led away sobbing. Monday 28th June 1915: The Ampthill Road Boys’ School has published an updated list of old boys who are serving in His Majesty’s Forces, in which the total number has risen to 407. 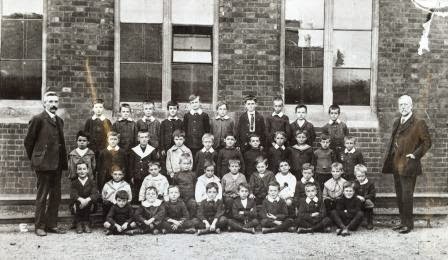 Out of the 400 or so boys who attended the school in 1903 no less than 46 have joined up, making this the most notable year. Additions to the list include five brothers from the Fuller family, with Sergeant Walter Fuller, Sapper William Fuller and Driver Cyril Robert Fuller serving with the East Anglian Royal Engineers, Private Horace Fuller in the 5th Bedfords, and Trooper Ernest Fuller with the 4th Hussars. 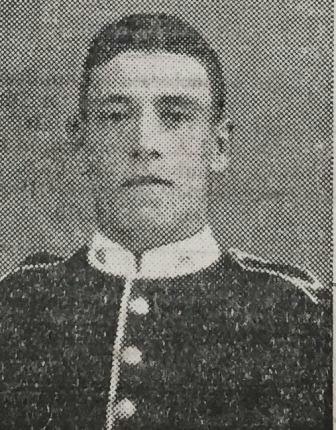 A sadder addition to the record is the death of Lance-Sergeant G. H. Swannell of 16, Holme Street, who has died of wounds received serving with the 5th Dragoon Guards. Never Play With a Loaded Gun! Sunday 27th June 1915: A fourteen year old Leighton Buzzard boy, Bernard Farr, was injured last night in an accident with a pistol. Farr lives with his grandparents, Joseph and Ellen Lansbury, in South Street. He was out for a walk with their youngest son (and therefore Farr’s uncle) Harvey Lansbury, aged eleven, near their home when Farr put a bulleted cap into a small pistol and pulled the trigger. The cap misfired. Farr then tried to prise the cap out of the breech, holding the barrel of the gun in his hand. Unfortunately he touched the trigger and this time the cap did explode. The bullet passed through Farr’s hand, between the base of his thumb and first finger, then cut through Lansbury’s clothing. Although Farr’s wound looked ugly it is not likely to cause any permanent injury. Lansbury suffered a large bruise and was badly frightened by the experience. By a strange coincidence Harvey Lansbury's cousin Amos Lansbury wrote to his parents, Mr. and Mrs. David Lansbury of Woburn Road, Heath and Reach, to say he was in hospital in France suffering from a wound in his right hand. Before the war Private Lansbury was employed at the printing works of the Leighton Buzzard Observer; he is now serving with the 1st Battalion of the Bedfordshire Regiment. Saturday 26th June 1915: Readers of the Luton News have been asked for their help in finding the owner of four photographs which were picked up on the battlefield at Hill 60 by Sergeant F. Usher of the 1st Devons. 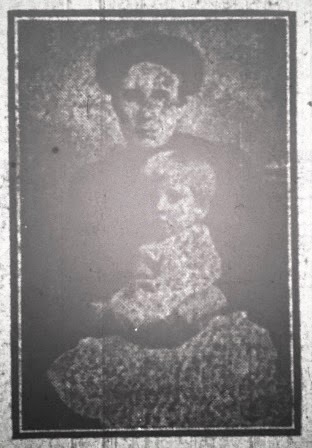 One shows a woman holding a young child. Two others show two soldiers, each with some flowers on the front of his cap, and the final photograph is of a man in a dark suit, wearing a button hold, standing beside a lady dressed in black and wearing a large black hat. The owner is believed to be from the Luton area because the envelope in which the photographs had been placed also included one of the cards which were sent with Lady Wenher’s Christmas gifts to the men of the Bedfordshire Regiment. Friday 25th June 1915: An advertisement has appeared in today’s Bedfordshire Times offering motor car and petrol lorry drivers a chance to serve their country by joining the Army Service Corps Mechanical Transport Branch, which urgently requires experienced drivers of these vehicles in large numbers. Men aged 19 to 45 are eligible and will be paid a minimum of six shillings per day with separation allowance payable in addition. Application can be made at any local recruiting office, and applicants will be tested tomorrow at the recruiting office in High Street Bedford by Second Lieutenant F. J. Keith Ellison, Mechanical Transport Officer. Experience is essential – men with motor school training only need not apply. Thursday 24th June 1915: The National Service League has appealed for working parties to be set up across the county to provide bags in which wounded soldiers’ personal effects can be placed. These are proving extremely useful at casualty clearing stations and in hospitals and large numbers are needed. The League will supply materials to volunteers and subscriptions have been requested for this purpose. Every five shillings subscribed will provide sufficient for 38 bags. Each bag requires 12 inches by 10 inches of unbleached calico, with double strings of tape and glazed calico labels sized 4 inches by 2 inches which are to be sewn on flat. Sample bags can be obtained from the Honorary Secretary of the League at 54, Clapham Road, Bedford. 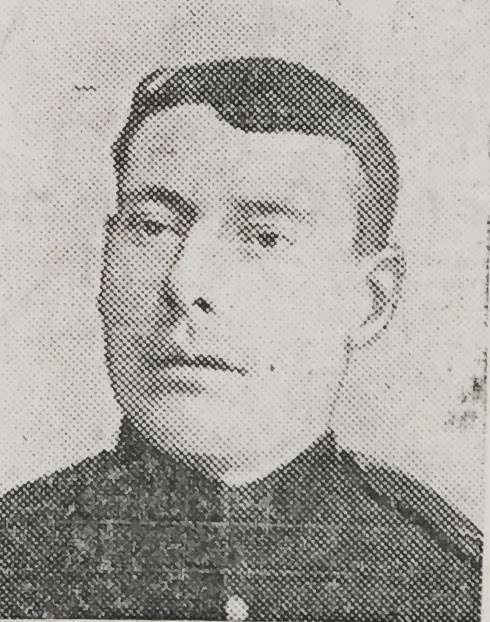 Wednesday 23rd June 1915: Private Percy Smith of Luton has returned to the trenches after being wounded taking part in the charge of the 24th Londons during the the Battle of Festubert on 25th May. A number of local young men had joined this battalion at the same time and were together in the battle. His comrade Corporal Martin was killed while bandaging the leg of Private H. Cook, another Luton lad, who was then dragged into the British trenches. Private Cook’s father recently visited his son in hospital at Bury St. Edmunds where he discovered that his son’s life was saved by Private Smith. Private Cook told him “We lay there until darkness set in, and then I took hold of Private Smith’s legs and he dragged me about 250 yards back to the British trenches, although wounded himself, and we had to get across two ditches”. Percy Smith lost his hearing and suffered from shock but is now recovered. His parents live in Wimborne Road, Luton, but he was brought up by his aunt, Miss Bleaney of 104, Church Street. Writing to his parents a week after the battle he told them: “I have been moved, as I had anticipated, to our place at Havre. I came up with a crowd of the Bedfords, all from Luton and the villages, I am just as deaf as ever, but more cheerful about it, and fairly fit otherwise. Just imagine for one moment, if possible, an attack in the trench for hours, while several hundreds of guns are sending shells through the air at a terrific rate. It sounds as if the heart of Hell itself has risen up in arms, sounding rough music”. 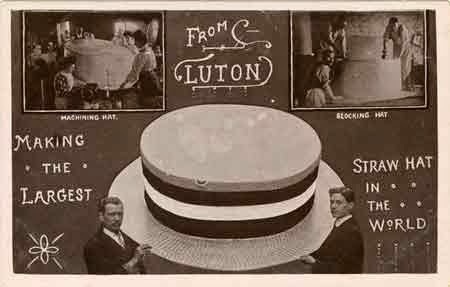 The straw hat manufacturers of Luton very much which this was true, but so far their efforts to secure Government contracts have met with no success. Two hat manufacturers recently travelled to London in the same train compartment without telling each other their business. On arriving at the War Office, one of the men met the other leaving. Unfortunately neither was successful in securing any work for the Luton hat factories. It is believed that St. Albans may have won a contract, a snippet of news which has been somewhat embellished by the Yorkshire Evening Post. Monday 21st June 1915: Mr T. E. Maw has made his annual report to the Public Libraries Committee of Luton Town Council in which he describes the effect the war is having on the library service. Unsurprisingly the number of books borrowed for home reading has reduced, while the soldiers billeted in Luton have made good use of the library. Many have expressed their appreciation of the Committee’s generosity in allowing them the same borrowing rights as local residents. The Committee’s faith has been rewarded as although the soldiers often had to leave at short notice on two books have not been returned. In 1910 a review of the library stock was carried out, since when 1550 books have been withdrawn from circulation and 3242 volumes have been rebound. Now that the books are in a much improved condition many local residents who had been deterred by the number of dirty and dilapidated books have taken out borrowers’ tickets. 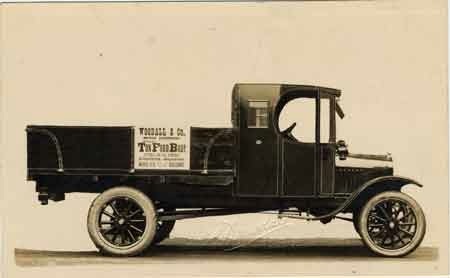 Since 1912 the number of tickets issued has risen from 3,810 to 6,761. To encourage more country members to use the library their subscription is to be reduced to 2s 6d per half-year. 85,245 volumes have been issued in the past year, of which 72,801 were fiction, and the reference room was used by 9,793 people (not including soldiers). Saturday 19th June 1915: This week a number of souvenirs from the Ypres district have been on display in the window of the office of the Biggleswade Chronicle. They include fuse caps from German shells, shrapnel fragments, shell bullets and rifle bullets, and were sent home by Sandy soldier Private Percy Gadsby of the 1st Bedfords to his father-in-law at Biggleswade. Sadly Private Gadsby has since been seriously wounded and is now in hospital at Aldershot. Lance-Corporal Dickens of the same battalion has identified the types of shell to which the fuses were attached. 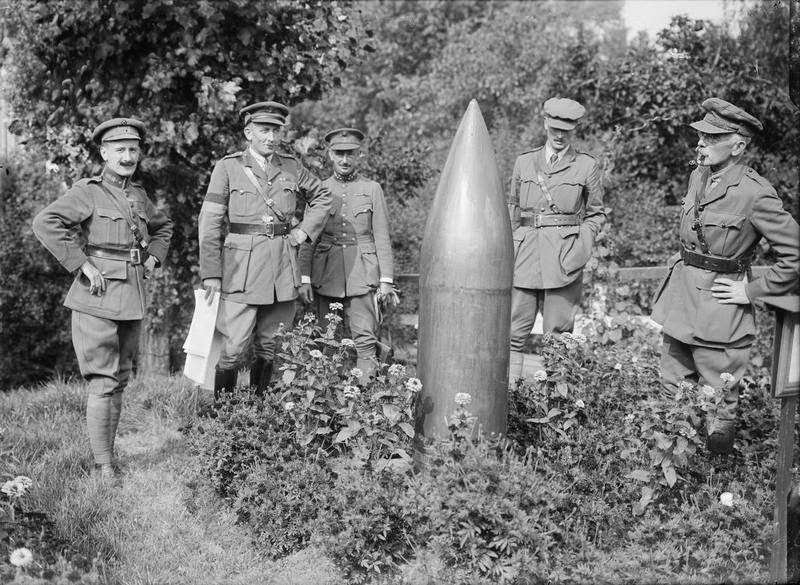 The largest fuse cap weighs over 3½lbs and belongs to a 15 inch shell, which Lance-Corporal Dickens points out is only one-tenth of the size of the fearsome Jack Johnson. Friday 18th June 1915: Private James Henry Tack of the Norfolk Yeomanry has appeared at the Woburn Petty Sessions today charged with driving a motor car on the highways in a manner dangerous to the public. 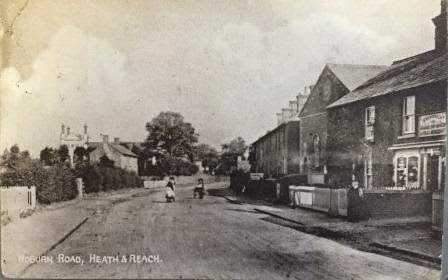 At 6.25 on the morning of March 31st Lieutenant Lister of the Royal Engineers was addressing a party of about 40 men on Sandhills Road, Aspley Heath when the car came along, driven furiously at a speed which manner both Lt. Lister, his sergeant and others of their men considered dangerous. The car was the property of Sir John Ramsden and Private Tack was his chauffeur and was driving the car to Sir John’s seat. His defence counsel said that Private Tack, a married man aged 29, had been driving as a professional chauffeur for eight years and had been head chauffeur to Sir John for four. He had a perfectly clean record. He had joined the Norfolk Yeomanry in September last year and was wearing his uniform as he drove. As a fellow soldier “he would be the last to attempt to ride over men who were also in the King’s service”. The Chairman of the Bench was confused as to why Private Tack was driving for Sir John Ramsden after he had enlisted. His counsel explained that Sir John held a commission in the Norfolk Yeomanry and Tack was therefore a military servant. The summons was dismissed under the Probation of Offenders’ Act and Private Tack was ordered to pay costs of £3 8s.6d. Thursday 17th June 1915: A gun team of the 4th Glamorgan Battery of the 2nd Welsh Royal Field Artillery was involved in a serious accident at Bedford this morning. Driver A. Gale and Gunner J. Williams were driving their gun carriage along London Road in the direction of St. John’s Street when something went wrong with the harness. The horses bolted along the railway bridge in St. John’s Street, crashing into a wall at the corner of St. Leonard’s Avenue. Gunner Williams jumped from the carriage and fell under one of the wheels; Driver Gale was also thrown to the ground. The men were taken to hospital where Gale was found to have suffered injuries including a compound fracture of the left hand; Williams has a broken leg and bruising. One of the six horses pulling the carriage was also severely injured. Wednesday 16th June 1915: By a curious coincidence three pairs of Biggleswade brothers serving in the army each have an elder brother who is a non-commissioned officer who has been wounded, and a younger brother who is in the ranks, serving in France and has so far escaped any serious injury. Sergeant Ernest Buck enlisted with the 1st Royal Dragoons 14 years ago. He served in India and Egypt and was promoted to sergeant just before the start of the war. He was at the Front from September until 31st May, when he received a shrapnel wound to the head. He is now at Liverpool Hospital. His younger brother George Buck enlisted in the Enniskillings nine years ago, but subsequently transferred to his brother’s Regiment and was a reservist when war was declared. He has also been in France since September. He has had many narrow escapes and been slightly wounded three times. Their parents live at Shortmead Street in Biggleswade. 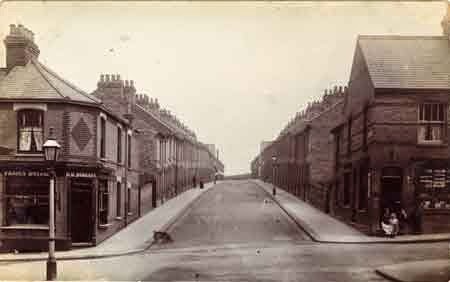 Unlike the Buck brother who are in the same Regiment Sergeant-Major Alfred Harper and his brother Herbert, the sons of Mr William Harper of York Terrace, have taken very different paths in the army. A skilled horseman, Alfred has served with the 11th Hussars for nearly 15 years. He was soon made a rough riding corporal  and has been a successful competitor in military tournaments at Olympia, where he twice won the gold cup. He has been at the Front since the beginning of the war and was in the saddle for 18 hours out of 24 for several days during the retreat from Mons. He was wounded at Messines in the autumn, receiving shrapnel bullets in his thigh and leg. After some weeks in hospital at Bury St. Edmunds he is now training recruits in England. He still has a bullet in his thigh. His brother Herbert (“Harbo”) was serving in India with the Royal Field Artillery when war was declared. He returned to England in the late autumn and has been in France since January, where he has so far survived unscathed. The third pair of brothers ar Corporal William Franklin and Driver Bert Franklin, the sons of Mr Franklin of Sun Place, Biggleswade. 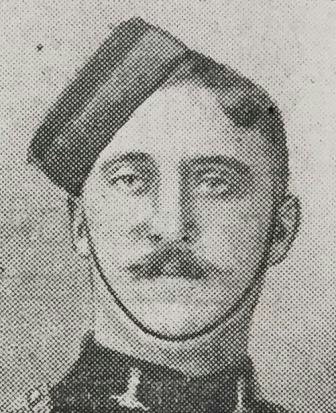 Corporal Franklin was formerly attached to the 2nd Bedfords, with whom he served for some years in Africa and Gibraltar. At the beginning of the war he returned immediately to the army as a reservist and went to France in August. He was wounded in the back on November 7th. 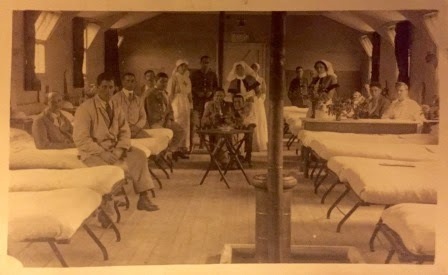 After a long period at Southampton Red Cross Hospital he returned home on leave, and is now at Landguard Camp. 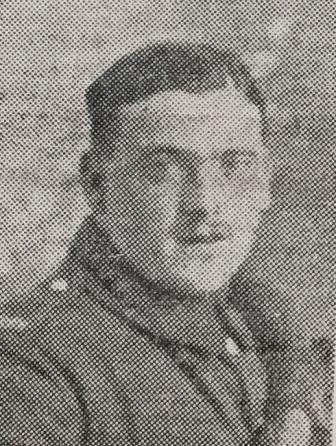 Like Herbert Harper Driver Bert Franklin is in the Royal Field Artillery, and the two men went to the Front at the same time. Bert has also so far escaped injury; on one occasion a shell went through the barn in which he and his mates were resting, but none of them were hurt. Another Biggleswade boy, Bombardier Sam Bailey, belongs to the same Battery. Riding little-trained or breaking untrained horses. 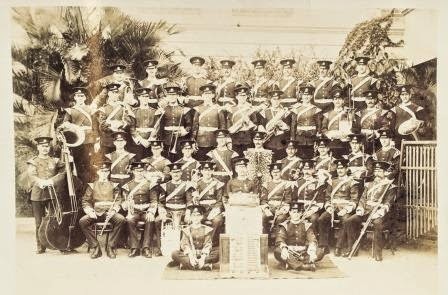 Tuesday 15th June 1915: When the war began the Band of the 2nd Battalion of the Bedfordshire Regiment pictured above was recalled from South Africa along with the rest of the Battalion and sent to France where the musicians were to act as stretcher-bearers - an extremely dangerous and onerous task. Since then six bandsmen have been killed, 21 wounded, one is a prisoner of war, and one has been mentioned in despatches and recommended for bravery. The Bandmaster, Mr Baxter, is now stationed at Bedford Barracks where several of the men are recovering from their wounds. Sergeant Eustace comes from Peterborough and enlisted in the 2nd Bedfords’ band as a boy twelve years ago. He returned from South Africa with the Battalion in October when he was a Lance-Corporal in the Band. While at the Front he received a bayonet wound in the leg, but he recovered from that and went back into the firing line. He was subsequently promoted to Sergeant, and is still at the Front serving as a stretcher-bearer. Monday 14th June 1915: A Luton man serving at the Front has sent an appeal to all the single men of Luton who are able to join up but have failed to do so, men he calls “worse than useless, because the fact of your idleness must cheer the hearts of the enemy”. He tells them “Your consciences must be unusually and damnably elastic. Can’t you see what it means, this indifference of yours? Every extra day of war means so many glorious English bodies laid under the turf, so many properties destroyed, and so much, ever so much, money wasted. That is what your indifference means, for it stands to reason that an increase in our numbers must hasten the day of peace.” He wishes that some of these “leisurely” men could visit him in France where he would show them three sights. First he would make them proud of England by showing them the marvellous organisation at base which keeps an army fed, clothed and armed. Secondly he would show them one of the nearby villages where nothing remains of the church but the crucifix at the altar, where the roads are torn up by shell holes, and where it is barely possible to tell that there were houses round the square, and ask them to imagined “dear old Luton knocked about like this”. Finally he would show them a burial party coming from the trenches at night to the battalion burial ground where they lay “the body of the man who has done his share. It is a very sad sight, but at the same time thrilling”. He believes anyone left unmoved by such sights must be a hopeless case. The anonymous correspondent wrote his letter “simply to relieve my feelings a bit. It makes my blood boil to think of the thousands of slackers there must still be at home”. He tells his readers “to search your consciences, think hard, and be a man.” Yes, their lives will not be so comfortable, but even a stable or a dug-out becomes welcome as a place to sleep on active service. And as for their mothers or sweethearts, even if they are sad at parting “their tears will soon be turned into smiles of pride and admiration on realising that you are at last doing your duty”. M. Van Huffell has also had a letter from his brother who was fighting with the Belgian Army and is now in hospital near Calais suffering from gas poisoning. The other refugees who had been accommodated at Maulden. 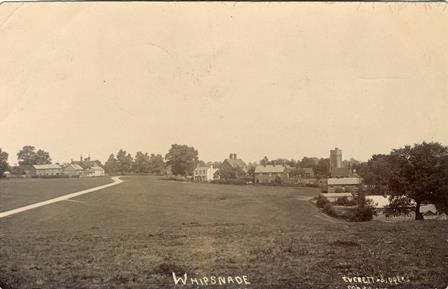 Saturday 12th June 1915: Rumours are spreading in the south of the county that another Zeppelin raid has been made during which bombs were dropped on the small, peaceful community of Whipsnade. The consensus is that six bombs fell on the village during a raid in which the Berkhamsted and Hemel Hempstead areas were also attacked. The Zeppelins are said to have escaped without drawing any defensive fire. The true story is rather less alarming. A large number of troops camped a few miles from Dunstable were carrying out night manoeuvres, during which heavy guns were fired as part of a mock fight. These startled a local resident out of her sleep and she, assuming the worst, sent a message to Dunstable announcing that bombs were being dropped on Whipsnade. Friday 11th June 1915: Mr Ernest Hart of Cowper Street, Luton, has written a letter to the Luton News, reminding us that we should not always judge by appearances. He complains that while walking along London Road with his wife and two children one of the 1/5th Bedfords called out to him “Hullo, Slacker; I hope you won’t rust out”. Mr Hart is working a 74 hour week for a company which is carrying out work for the Government. On top of this he has to look after 25 poles of garden for his invalid parents, even though this requires a 26 mile round trip by bicycle; this garden is his parents’ only means of livelihood. Meanwhile one of his brothers is serving with Kitchener’s Army, another is suffering from consumption, and his sister has to keep house for their parents. He wishes the soldier to know that he would be only too happy to change places with him if it were possible and says “If soldiers don’t know the difference between a “Slacker” and a worker, I will ask them to keep their mouths shut before they insult men who are risking their lives in factories and earning the means of providing them with bread. 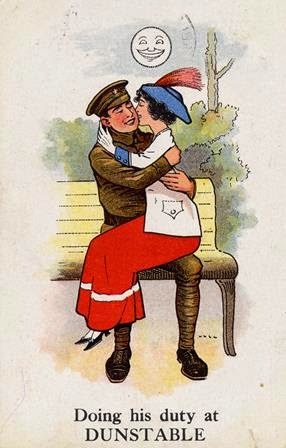 Thursday 10th June 1915: News has reached the village of Toddington that two of its men have been wounded. Private T. Garner of the 2nd Bedfords sent a card to his brother on 19th May to say he had been admitted to hospital after receiving shrapnel wounds to the head, chest, and a finger. He was taken from to the General Hospital at Sheffield and sent from there to the Red Cross Hospital at Chesterfield. He is progressing well and hopes soon to be fit enough to visit his friends and relatives at Toddington. The second man, Charles Pearson Hobbs, emigrated to Canada several years ago with his younger brother and the two men had been doing well farming. On the outbreak of the war Charles volunteered to serve in the Canadian Forces. After training in England his company was sent to the Front six weeks ago and took part in the Battle of La Bassée. Two weeks ago the company was sent to the reserve trenches. After heavy fighting, in which the Germans were driven back two miles, a German shell exploded killing four of Hobbs’ comrades and wounding a number of others, including Hobbs himself. He was taken to the Leicester Base Hospital in England while still unconscious. He has since recovered consciousness but with a temporary loss of speech. Hopes are high that he will recover. 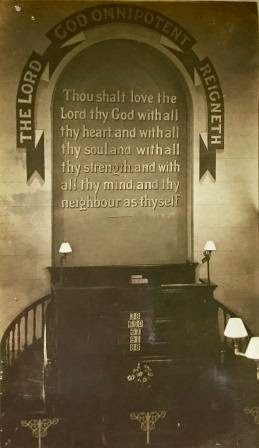 Wednesday 9th June 1915: Following a meeting of Luton Town Council last night the decision has been taken to ban newspapers published by Lord Northcliffe from Luton Public Library. This decision has been made in response to the “scandalous and unscrupulous attack” made on Lord Kitchener by the Daily Mail, the Times and the Evening News. Other newspapers connected with Lord Northcliffe belong to the Associated Press, putting them on a rather different footing, and these are not to be covered by the ban. The Libraries Committee had not requested a ban; although they objected to the statements made in these papers they felt that any action should come from the national government. Alderman H. Arnold of this committee suggested a vote of confidence in Lord Kitchener would be sufficient and pointed out that the Times was a paper of national reputation; there was some subsequent argument over whether this could still be considered the case. 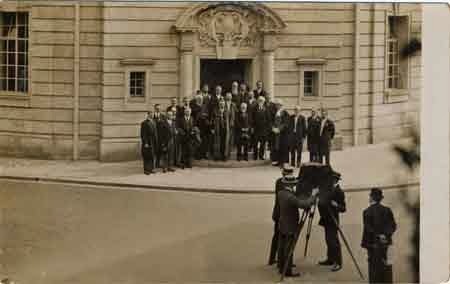 Mr. C. W. Esscott did not see why he should be deterred from reading the Evening News in the library just because other people did not agree with its views, and Mr. W. W. Merchant thought the Council would be going beyond its rights in banning the Times, a national paper which published letters from eminent men which did not appear elsewhere. Despite these arguments against the resolution it was carried by a majority of twelve to eight. Tuesday 8th June 1915: The recruiting march of the 2/5th Bedfords visited the town of Biggleswade today. The marchers had left Sandy at 9.20 a.m. and travelled through Everton and Potton, reaching Biggleswade just after 12.30 and arriving at the Market Place just before 1pm.. The town was in holiday mood, with flags flying from the Church tower and streamers hung across Stratton Street and the High Street. The Band struck up a stirring march as the soldiers reached the Baulk. After a free afternoon the soldiers were given a foot inspection at 6 pm and at 6.30 the drums beat retreat. At 7 pm the band played a concert to a large audience following which the recruiting meeting was held. Over a thousand people heard Major Orlebar tell them of the importance of increasing the strength of the Territorial Battalion now that the 1/5th Bedfords were about to leave for the Front. It would take three to four months to train new recruits, and it was essential to have men ready to take the place of any casualties. He assured his audience that the men of Biggleswade would be kept together, with friends and comrades standing shoulder to shoulder. He promised that this principle would be adhered to so that “30 years hence, over a friendly pipe, friends would be able to tell to their children what they did during the great war. They would be able to recall old scenes of the battlefield, and tell the tale of valour, which would be a delight not only to their children but to their children’s children.” Major Orlebar saluted the town’s old Crimean War veteran Mr George Smith and said he was sure nothing would give him more pleasure than to see the young men of the town volunteer. The march had so far been met with more discouragement than encouragement. The aim was to raise 550 men for the new battalion and after three weeks had only recruited 160. Hopes were high that Biggleswade would produce between 30 and 50 recruits. However these were disappointed as only twelve men volunteered and of these five failed to pass the medical test. The remaining seven will leave by train for Bedford at 12 pm tomorrow. The marchers are to be on parade at 8.45 am in the morning and will leave at 9.20 for Shefford. This principle inspired the famous Pals Battalions. Later in the war local men were no longer expected to serve together as the consequences for a local community of losing many of its men in a single attack were so unfortunate. A further six men volunteered at Shefford and left for Ampthill the next morning. A tea was given last month for the Belgian refugees of the district. About fifty, with friends, attended. As it was a fine day there were various pastimes in the gardens and the afternoon ended with a concert by the brass band. A vote of thanks was given by Mr. C. Marien, who gave a graphic description of their flight from Antwerp and the trials they had undergone on their way to England. 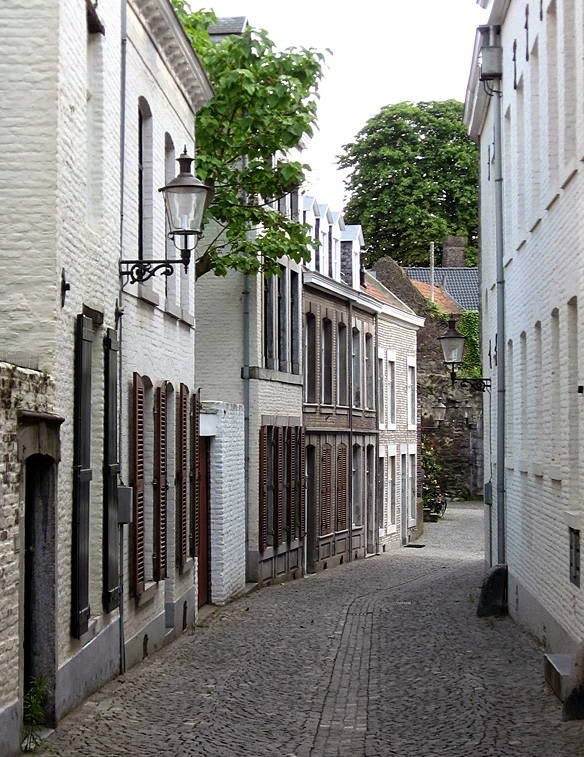 He hoped that when the Germans have been evicted the band would come to Antwerp and take part in the celebrations. As the village correspondent says “how extraordinary it seems to write the above. If anyone had predicted a year ago that we should have been entertaining Belgian refugees at Barton, it would have seemed incredible”. The Cricket Club has decided to not play regular fixtures this season due to the war, though it is hoped that some scratch games may be arranged with so many soldiers around. 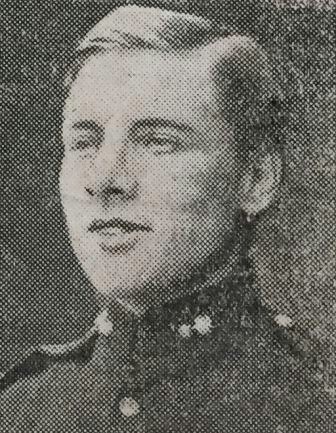 Bert Royston, who has often helped the village team, went to the Front with the Canadian Scottish and has been taken prisoner. 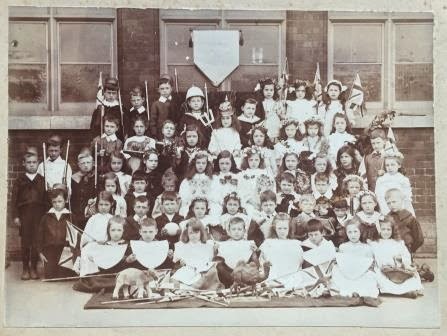 As the school was closed for Whitsuntide on Empire Day, May 24th, the children celebrated it early on Friday 21st. Prizes were given out by the Vicar, there were songs and flag-waving and a speech given by Miss Leach. Each child brought in one penny in order to send tobacco, chocolate and other comforts to our soldiers and sailors who are “fighting the greatest fight for honour and freedom the world has ever known.”. The children of Gravenhurst also celebrated Empire Day on 21st May, when they saluted the flag, sang the National Anthem, and marched into the schoolroom singing patriotic songs. They were then given a half-day holiday. Eggs are still being collected weekly for the wounded soldiers at Wrest Hospital and delivered to the hospital every Thursday by the Misses Jones. The eggs are much appreciated but they are currently being provided by only a small number of people and an appeal has been made for more parishioners to donate. The authorities at Wrest say they can make good use of as many eggs as the village can send them. Every little helps, even one egg a week! Forty three men who are either from this parish or closely connected with it have now joined the armed forces. Sergeant G. Gazely has been at the Front since the beginning of the war and has now been wounded for a second time. 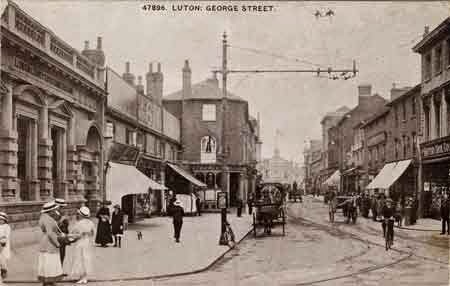 Sunday 6th June 1915: Luton has been in a state of high excitement this weekend as the 1st/5th Battalion of the Bedfordshire Regiment, which left the town in the first days of the war, passed through on its way to the Front. The battalion went to Bury St. Edmunds, where it spent many months in training, then to Norwich and most recently to Sl. Albans to be equipped ready to leave for France. This weekend the battalion has undertaken a route march through Bedfordshire. After marching from St. Albans to Dunstable the troops continued to Bedford on Friday, back south to Luton yesterday, and will leave the town this evening to return to St. Albans. 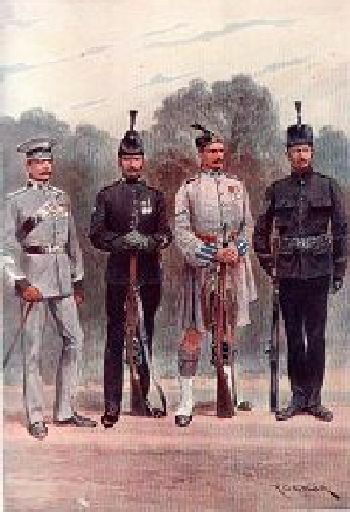 On both Friday and Saturday the men were required to march twenty miles, but they remained in splendid condition and have been complimented as one of the smartest Territorial battalions. They set off from Bedford at 6.10am yesterday and were originally expected to arrive at Wardown Park at about noon, with a civic reception planned for 2pm. Due to the trying conditions caused by the heat and patches of tarred road the men were allowed a long rest at Barton and did not arrive in Luton until 7pm. 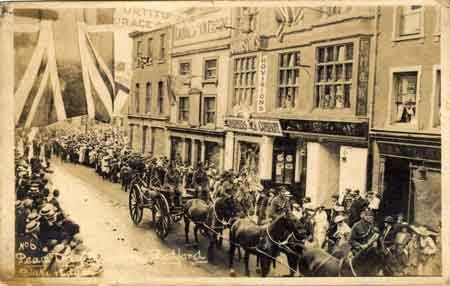 The town greeted the soldiers with streets decorated with flags and a large crowd of spectators. Despite the crush the police were able to keep the crowd in good order. The battalion arrived led by the cyclist section, followed by the signalling section and the band, then the four companies, in turn followed by the machine gun section with their bulldog mascot, and finally the baggage train. They were welcomed by the Mayor who reminded them of the heroism of their fellow Bedfords at Ypres and at Hill 60 and wished “all honour to our Lutonians and Bedfordshires”. He also offered all the men a free dip in the Waller Street swimming baths this morning. Lieutenant-Colonel Brighten replied on behalf of the battalion, promising that the men would do their part, and led his troops in three cheers for those who had given them such an enthusiastic reception. The crowd returned the three cheers, the band played the national Anthem, and marched off to Luton Hoo Park where they spent the night. This morning the battalion attended a church service where the vicar gave a stirring address. The men were given free time for the rest of the day. They are to assemble at the Park at 6.30pm for the march back to St. Albans. The band is to stay behind to give a concert at Wardown for which a large audience is expected. Both Captain John Percy Farrar and Colonel Sir George Farrar were old boys of Bedford Modern School. The Commonwealth War Graves Commission website gives the date of Captain Farrar’s death as 9th April 1915. 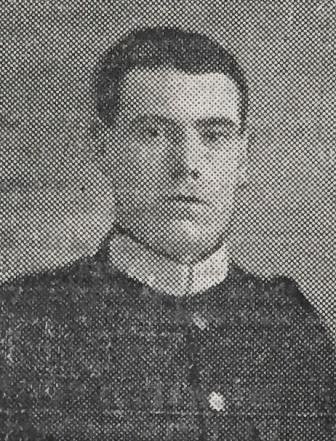 Friday 4th June 1915: News has reached Bedford that Captain Basil Maclear, who attended Bedford School from 1893 to 1899, has been killed in action at Ypres. 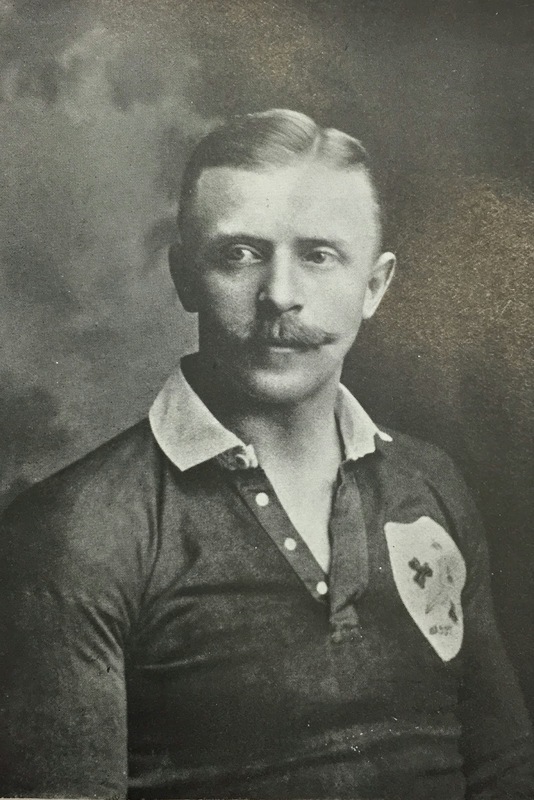 One of the finest backs ever produced by the school Basil Maclear played centre three-quarter for the Irish Rugby team from 1905 to 1907, becoming one of the most famous players of the day. An all-round athlete, he also played for the school cricket XI and ran the hundred yards at the Bedfordshire County Sports in 10 seconds. From Bedford he moved on to Sandhurst where he represented the Royal Military College at cricket, Rugby and athletics. After serving with the Royal Dublin Fusiliers in the Boer War and in Ireland he became a gymnastics instructor at Sandhurst. With extraordinary speed for a man of his size, Maclear was near impossible to tackle once in his stride. The try he scored against South Africa in November 1906 after an 80 yards’ run was unforgettable to anyone who witnessed it. As a player he has been described as “forceful rather than subtle … he was dangerous in attack and formidable in defence, running straight and hard, and handing-off with a force which was only equalled by the tremendous vigour of his tackling”. At the beginning of the war Basil Maclear’s desire to rejoin his regiment and go to the Front was thwarted as he could not be spared from Sandhurst. In a confidential report General Capper wrote “This officer is too valueable to be spared for active service”. This comment was later crossed out at Maclear’s request and he left the Royal Military College at the end of February. He took a large draft of men to the Front around March 24th and remained at the Front with his own regiment. When the 2nd Battle of Ypres began the Dublins were rushed to the front line where Basil Maclear took part in all the heavy fighting. For much of the time he was Second in Command of the regiment, and for four days he was in full command. On May 24th the Dublins were defending a line of trenches which offered little protection against enemy fire. At 3 a.m. the Germans launched a heavy gas attack which caused the defenders to fall back. The Colonel of the regiment was killed early in the attack. 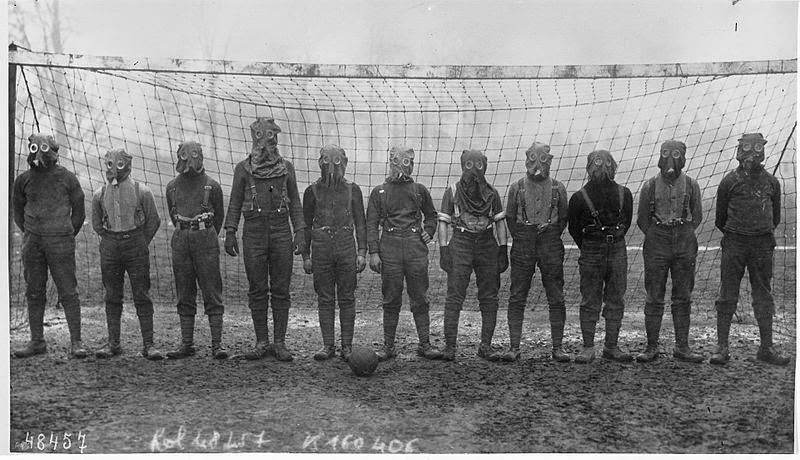 Maclear appeared impervious to the effects of the gas and helped the men around them to put on their respirators. In the middle of the morning he led a bombing party against the advancing Germans, shouting “Come on! Do you want any more?” when he fell, shot through the throat. He died almost immediately. When the order came to withdraw that night only thirty men remained from an entire battalion. Lt-Colonel Percy Maclear was buried in the same grave with two other Old Bedfordians, Major T. N. Puckle of the Leicester Regiment and Captain A. C. Aubin of the East Lancashire Regiment and 2nd Nigerian Regiment. A third brother, Lt-Colonel Harry Maclear DSO, East Lancashire Regiment was killed in action in March 1916 while commanding the 13th Royal Scots. The remaining two brothers survived the war. One, Arthur Maclear became known as a miniature painter; the other, Lt-Colonel Ronald Maclear had also been a noted Rugby player, playing 48 county matches and appearing for England vs. The Rest of England.